It is not uncommon for inflected nominal forms to be incorporated into verbal paradigms, as in Imonda progressive construction tōbtō soh-ia ale-f ‘he is looking for fish (lit. fish search-loc stay-prs)’, where the verbal noun ‘search’ is in the locative case. Equally, nominal inflection classes are not uncommon. But the two rarely cooccur. We present two case studies (the only examples we are aware of) as a contribution to the typology of inflection class systems: the Western Nilotic language Nuer, and Old Irish. In these languages nominal inflection class distinctions in case marking have become part of the verbal paradigm through the incorporation of constructions involving deverbal nouns. This provides a unique context for observing the properties of inflection classes. In Nuer, case inflection of the verbal noun can be deduced through a cascading series of implicatures, laying bare processes which are entirely covert in the ordinary noun system. With Old Irish, its transition to the modern period was accompanied by a split in the behaviour of verbal nouns, whose inflection class system was simplified when used verbally, but left intact in other contexts, showing that incorporation into the verbal paradigm had real effects on the system. We start with two observations. The first is that case-inflected nominal forms may be employed in verbal constructions. For example in Latin, participles (verbal adjectives) feature in a number of periphrastic constructions, as in (1), where the nominative case participle in conjunction with the copula forms the perfect. In Imonda, a Papuan language of the Border family, progressives are formed by combining the verb ‘stay’ with a verbal noun in the locative case (2). In the Mongolic language Buryat, nominalized verb forms serve various converbial functions (Skribnik 2003:116), as in (3), where the verb takes an ablative case ending to convey the meaning ‘since’. The second observation is that inflected nominals may fall into different inflection classes; that is, that different sets of words show different morphological realizations of what are otherwise the same morphosyntactic values. In both these languages case-inflected nouns play an important role in the verbal paradigm, and fall into the inflection classes typically found in the noun system. This provides a novel vantage point for looking at inflection classes. Because they have a systematic connection to another word class, that means that they are not just a property of the word class that normally contains them, but also exist as part of a larger system, in this case the verbal paradigm. The case studies presented here enable us to make two interesting observations. In Nuer, the inner workings of inflection class assignment are laid bare: the verbally-employed nouns constitute a microcosm of the inflection class system as a whole, but one in which there is a consistent morphological back-story to each and every lexeme (namely, the verbal paradigm), unlike what one finds in the opaque system found in other nouns. With Old Irish, the diachronic developments going into the modern period suggest that association with the verbal paradigm has led to a reduction or loss of inflection class distinctions in verbal nouns, while they retain these distinctions when used outside of verbal contexts. This paper is structured as follows. Section 2 lays out the Nuer facts, showing the role of case-inflected verbal nouns (gerunds in our terminology, to distinguish them from other types of verbal nouns) in the verbal paradigm, how they are derived from the verb stem, and how they recapitulate the four case inflection patterns found elsewhere in the noun system. Section 3 presents the comparable situation in Old/Middle Irish, and shows how verbal nouns have split in Modern Irish: inflection class distinctions are retained when they are used as ordinary nouns, but lost when they are used in verbal constructions. Section 4 concludes, pointing out the typological and theoretical observations that can be drawn from this seemingly rare phenomenon. Nuer is a Western Nilotic language of the Dinka-Nuer subgroup spoken in the Republic of South Sudan and Ethiopia by anywhere from 900,000 to well over two million speakers.2 Nuer has a number of dialects that can be separated into two broad varieties which we term Western Nuer and Eastern Nuer. Western Nuer, also known as Bentiw, is spoken in Ruweng, Northern Liech and Southern Liech States of South Sudan. Eastern Nuer is spoken over a vast geographical stretch – in Western Bieh (Fangak), Eastern Nile, Latjoor, Eastern Bieh and Jongley States of South Sudan and the Gambella region of Ethiopia. Many South Sudanese Nuer live abroad due to a persistent unrest in the native territories. Large Nuer settlements can be found in the U.S.A. and Australia as well as in Eastern Africa. Previous studies include Crazzolara (1933), Vandevort (n.d.), Yigezu (1995), Storch (2005), Frank (1999), Baerman (2012) and Faust (2017), among others. Nouns in Nuer inflect for three cases: nominative, genitive and locative, whose use we illustrate here with the noun ‘home’. The nominative is in effect the default case, used both for subject and for object, as in (4), among other things. The genitive is used in adnominal constructions, as in (5), where it is the complement of the gerund ‘thinking about’ (thus literally ‘I want the thinking about of the home.’). The locative indicates location, as in (6), where it is used in conjunction with the uninflected copula, or goal of motion, as in (7). The parallel constructions with a gerund in place of an ordinary noun are shown in (8)–(11), using the verb ‘kick’. In (8) it is the nominative object of the verb ‘want’, and itself takes a genitive complement. In (9) it is the genitive complement of the gerund ‘thinking about’, which itself is the nominative object of ‘want’. These two patterns are the usual way of making one verb the complement of another. In (10), following a cross-linguistically familiar pattern, the locative forms the basis of a progressive construction, (thus literally ‘Bool is on kicking of the person’), while in (11) it expresses purpose as the complement of a verb of motion. Note that the nominative of ‘kicking’ is identical to the genitive. Gerunds typically display syncretism of two out of the three cases, but which cases those are depends on inflection class. In order to demonstrate the validity of the three-way case distinction, we repeat (8)–(10) with the gerunds of two other verbs: (12)–(14) show a gerund with nominative/locative syncretism, and (15)–(17) show a gerund with genitive/locative syncretism. Although gerunds are nominalizations, we hold that the forms illustrated here still constitute a part of the verbal paradigm. As shown in Sects. 2.2–2.3, gerunds are productive and available to every verb, and they are required to form a progressive construction, and to allow one verb to be the complement of another verb. This gives nominal morphology, in particular case morphology, a point of entry into the verbal system. Nouns fall into different inflection classes on the basis of case-marking morphology, as is shown in Sect. 2.3, and these find their way into the verbal system through constructions that use the gerund. As a necessary precursor to describing the morphological properties of the gerund we first sketch out the basic elements of the verbal paradigm. Nuer verbal morphology can be divided into two cross-cutting systems that we distinguish as inflectional and derivational. The inflectional paradigm consists of (i) finite forms, (ii) non-finite forms that are used with auxiliaries, and (iii) the gerund. The derivational paradigm distinguishes various types of valence alternations (both arguments and goals), as well as iteration. 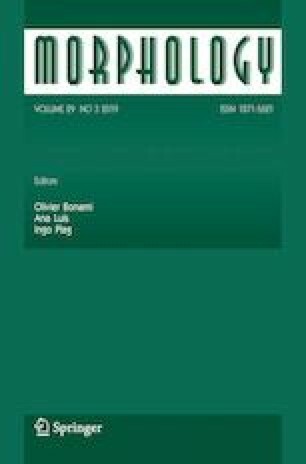 An account of the verbal paradigm in turn presupposes an understanding of the system of morphological exponents, whose surface manifestation may seem opaque to those not familiar with the morphophonology of Western Nilotic languages. Morphological alternations in Nuer involve both suffixation and stem modification. While suffixation is straightforward, stem modification involves complex alternations of vowel and voice quality, length and tone, a full account of which warrants separate studies of their own (for example, see Reid 2017; Monich 2019). What is crucial for our purposes here is a system of two cross-cutting sets of alternations of the root vowel (verbal roots are invariably monosyllabic), which we distinguish as grade A∼B and grade 1∼2. Table 1 illustrates the basic principles, using the verbal root meaning ‘kick’. Within the verbal system, the grade A∼B alternation characterizes inflectional values such as person/number, as shown here with the contrast between 3sg and 1sg subject forms. The grade 1∼2 alternation characterizes derivational alternations, exemplified here by the contrast between the transitive paradigm and the corresponding antipassive, which is a derived intransitive. 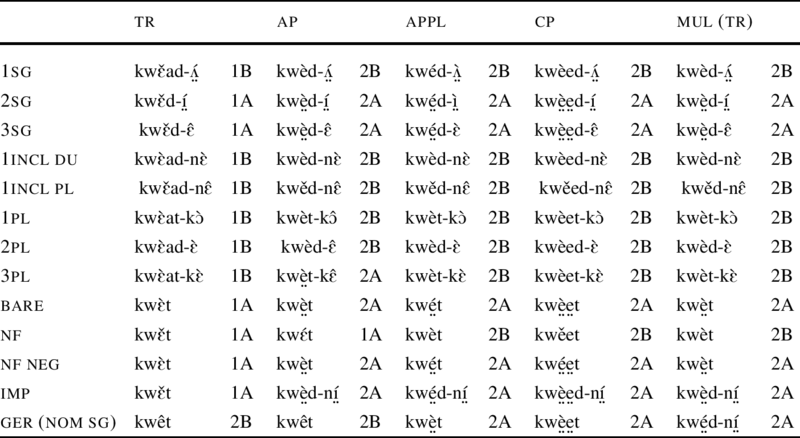 Table 2 shows the complete vowel inventory of the language classified in terms of the grade alternations. The grade A∼B alternation typically involves lowering (e.g. Open image in new window ), along with diphthongization for some vowels (e.g. ɪ∼ɪε); high mid vowels however undergo a voice quality change from breathy to modal voice ( Open image in new window ∼e and Open image in new window ∼o). Grade 1∼2 typically involves raising, alongside voice quality change from modal to breathy voice. For the sake of clarity, in subsequent paradigmatic tables we include the information about the grade of the stem vowel next to the word form (e.g. Open image in new window 1A). Table 3 exemplifies verbal morphology, with the inflectional values as rows and a selection of the derivational paradigms as columns. We review here briefly the various functions. Along the inflectional dimension, the subject-marked forms are used with the non-negated present tense, except when a nominal subject immediately follows the verb, in which case the bare form is used. The nf form is the general form used with auxiliaries (e.g. for past and future), while the nf neg is used just with the present negative auxiliary. Along the derivational dimension, the transitive (21) is arguably the basic form.4 Some of the derived paradigms involve valency changes, either reduction through the removal of the direct object (the antipassive in (22)), or increase through the addition of an argument (the applicative in (23)). The centripetal form signals a movement towards a reference point (24). (Not illustrated here are the valency-reducing paradigms that can be generated for the applicative and centripetal forms.) All of these categories can further derive multiplicative forms that signal that the action is performed multiple times or over a period of time, illustrated here with a multiplicative transitive (25). The gerund occupies an exceptional place within this paradigmatic matrix. First, gerunds always have a grade 2 vowel. This means that within an underived transitive paradigm, where all other forms can have a grade 1 vowel, the gerund stands out by virtue of its grade 2 vowel (see Table 3 and fn 8). Second, and more importantly in the present context, gerunds have not just the nominative form shown here, but a genitive and locative form too. This is where nominal inflection classes enter into the picture. The class membership of a noun is not phonologically determined, nor is there any single form which would allow one to predict the entire paradigm. For example, if a noun has a grade A nominative, it could belong to either the first type or the fourth type; if a noun has a grade A suffixed genitive/locative, it could belong to the third type or fourth type. That means that nouns require two principal parts in order to unambiguously identify which inflectional pattern they follow. For this reason we consider the four types represented in Table 4 to be lexically specified inflection classes. That said, not every pattern is equally well represented in the lexicon. If we take the nominative as the point of departure, if it has a grade A vowel, the noun will usually inflect like ‘forest’. If the nominative has a grade B vowel, the noun will usually inflect like ‘goose’. A prominent exception to this generalization are productively derived deverbal agent nouns, and phonologically aberrant words such as unassimilated loanwords: these inflect like ‘dove’, with a grade A vowel plus suffixation. Gerunds follow exactly these four patterns, as shown in Table 5. (Note that they invariably have a grade 2 stem vowel, a point we return to below.) The phonological properties of the verb stem determine the nominative form of the gerund, but do not determine the behaviour of the oblique case forms. This is lexically specified, and it is in this sense that nominal inflection class distinctions have become part of the verbal paradigm. Oblique case morphology can then in principle follow either type (with or without suffixation), but there appear to be strong tendencies, again based on phonological properties of the verb stem (Table 7). If the verb has a short stem, it will typically be unsuffixed, while if it has a long stem, it will typically be suffixed. There are two classes of exceptions. First, long stems that end in a glide (/j/ or /w/) shorten in the gerund. They still take the oblique case suffixes predicted by their underlying stem length, but the gerunds themselves are short (Table 8), so that the length of the nominative itself is not predictive, as was the case with verbs in Table 7. Second, lexical exceptions to the usual association between stem length and oblique case suffixation are not infrequent (Table 9). Some short stem verbs also permit an alternative suffixed oblique form (‘sharpen’), while some long stem verbs take unsuffixed oblique case forms (‘drink’). That means that the inflection class distinctions in the gerund can still be lexically specified, even in the face of default tendencies. The four inflectional classes exist only for gerunds formed from underived verbs (transitive verbs in the vast majority of cases, though there are also a handful of underived intransitives). Gerunds of derived verbs display uniform behaviour across the lexicon. There are two types. The first, found with most derivational paradigms, is represented in Table 10 by a applicative verb: the gerund has oblique case suffixes and an invariant grade A stem. The second is found with multiplicative verbs whose gerunds inflect as plural nouns, reflecting their inherent event plurality through explicitly nominal plural marking. As with the singular, plural case inflection in nouns falls into different classes, but only one of them is found with gerunds, namely a grade A stem vowel plus the suffix - Open image in new window , the same for all three cases, as in Open image in new window , the gerund of the multiplicative of ‘kick’ in Table 3. To conclude this section, we review the basis for the claim that verbs in Nuer incorporate nominal inflection class distinctions. It depends on the assumption that we can understand gerunds as part of the verbal paradigm and not just as deverbal nouns, at least when they used in the sorts of constructions illustrated in (4)–(20). It is admittedly difficult to find arguments one way or another. Thus in contrast to the Latin gerund ‘see’ in (26), which takes an accusative complement, they retain nominal properties of government, taking a genitive complement rather than the nominative complement that would otherwise be expected of verb. But it is hardly unreasonable to ascribe their various uses – for example, verb-verb complementation, progressive aspect, or purpose – to the sphere of activity of verbs. Were it not for their nominal morphology, one would hardly hesitate in identifying gerunds as part of the verbal paradigm. The other aspect of our claim is the identification of the different case inflection patterns as inflection classes, in the sense that there is lexical specification of inflectional morphology. To the best of our knowledge this must be true, for both ordinary nouns and for gerunds. Gerunds formed from underived verbs face a two-way lexical choice: while the nominative form is largely predictable from phonological properties of the stem, oblique case inflection can still follow either of two patterns. Although there are some tendencies based on stem phonology, there is still room for lexical specification, as illustrated in Table 9. The functions illustrated here are similar to those found with the Nuer gerund, e.g. as a verbal complement (28) or as a progressive based on a locative construction (30), and, as in Nuer, the verbal noun has nominal syntactic properties, taking genitive complements, as in (27) and (29). And crucially, they fall into different inflection classes. As a conservative Indo-European language, Old (and Middle) Irish retains a wealth of nominal inflection classes. Verbal nouns are not formed by any identifiable morphological operation, but rather are ordinary-looking nouns distributed across the different classes. Some examples of the progressive construction with the preposition oc (as employed in (30)) are given in (31), showing a variety of dative case forms according to the different inflection classes. Noun paradigms in the corresponding inflection classes in are shown in Table 11, using the exemplary paradigms given by McCone (2005). Note: nominative and genitive forms for illustration are taken from the Dictionary of the Irish Language: Based Mainly on Old and Middle Irish Materials (eDIL). There is no straightforward relationship between the forms of the verbal noun and the rest of the verbal paradigm. McCone’s extensive study of Old Irish verbs (1997) defers all discussion of verbal nouns to Thurneysen (1946), who observes that ‘[t]he formation of these verbal nouns is governed by no uniform rules’ (p. 444), though there are certain subregularities. Thus weak verbs (characterized by a suffix -a or -i in the present stem), most of which are denominal, usually form their verbal noun with a dental suffix and inflect according to class III, for example nom sgmórad, gen sgmórtho from -mora (3sg prs conjunct) ‘magnify’ (Thurneysen 1946:445, 459).15 Verbal nouns formed from strong verbs, whose present stem lacks a vocalic suffix, show a greater variety of stem formations, and hence, a greater range of inflection classes. Modern Irish retains a rich set of inflection class distinctions in its nouns, including verbal nouns, although case inflection has largely been reduced to the opposition of two forms: nominative vs. genitive (Carnie 2008, Chap. 5), as shown in Table 12. It also retains the use of verbal nouns in verbal constructions. Crucially, the elimination of genitive allomorphy means that verbally-employed verbal nouns still have lexically specified morphology, but it is restricted to a single form. It is thus probably no longer correct to speak of inflection class distinctions, but rather of one-off morphological irregularity. Either way, the inflection class system has undergone simplification precisely in the context of the verbal paradigm, but not elsewhere. The Nuer and Old Irish nominal paradigms provide a typologically unusual context for the exploration of inflection classes. Normally, inflection classes are understood as confined to the word class in which they are manifested, and this is understandable, since this is the only context in which they are relevant. But nominal inflection classes in these languages lead a double life: as a property of nouns, and as a component of verbal paradigms. It is not self-evident that this should be so. Stump (2016) characterizes a similar configuration as metaconjugation, which refers to a set of morphological forms that occur in different paradigmatic contexts with different lexemes. Stump illustrates this with an example from Sanskrit, where the stem formative morphology used for the present system (present and imperfect indicative, optative, and imperative subparadigms) for some verbs is used for the aorist system (aorist indicative and precative subparadigms) for others. For example, a stem formed from suffixation of -a is used for the imperfect indicative (present system) with ‘strike’, but for the aorist indicative (aorist system) with ‘be happy’ (Table 13). But Stump does not suggest that we should expect the two instantiations of this stem-formative class to deviate from each other as a consequence of this split, as has happened with the two instantiations of case inflection (nominal and verbal) in Irish. The closest parallel we are aware of to the Irish developments occurs when an inflected form becomes lexicalized and consequently immune to later changes that affect the source paradigm. For example, the adjective molten was derived from a now-obsolete strong participial form of melt which has since been replaced by the productive weak form melted. The change there is understandable, because only the properly verbal form was subject to the paradigmatic pressure to replace its irregular morphology, while the isolated adjective was not. But the Irish example is different, in that both contexts involve inflected words, and it is not clear what paradigmatic pressures would have affected the genitive of verbal nouns in their verbal use that would not also have affected them in their function as independent nouns. Frequency may have played a role, in that the verbal construction which employs the genitive of a verbal noun is not common, perhaps making it prone to levelling across the lexicon. But lacking more detail about the historical developments, we do not wish to over-interpret these observations, and so leave these as open questions. The key point is that what had once been an independent and morphologically heterogeneous set of nouns has undergone innovations in its case inflection as a consequence of its association with the verbal paradigm. Nothing of the sort is seen in Nuer, gerunds inflect in the same way as other nouns. We can draw no conclusions from that; first because we would claim no inevitability to the developments seen in Irish, and second, because we have no idea how long this state of affairs has existed in Nuer. (Comparable verbal uses of deverbal nouns have not been described for Dinka or Reel, the languages most closely related to Nuer.) But the systematic relationship of gerund inflection to the rest of the verbal paradigm does provide a unique perspective on the nature of inflection class membership. With ordinary nouns there is not much we can say. While there are default tendencies, these can be overridden, so that the lexical entry for any noun would need to list two principal parts, as suggested in Sect. 2.3. But gerunds slot into the paradigm of the verb in a way that allows us to see inflection class membership in terms of layers of morphological predictability, summarized in Table 14. First, there is a split between underived (typically the underived transitive) and derived verbs (such as applicatives). Gerunds of derived verbs all inflect according to the same pattern, while those of underived verbs are subject to further conditions. Two phonological properties of the verb stem (length and vowel grade) unambiguously determine the form of the nominative. Verb stem length alone then determines typical oblique case inflection; recall that in the case of glide final stems, this length is covert in the gerund itself, because the underlying length distinctions have been neutralized. Finally, lexical specification can override this default assignment of oblique case forms. Thus while inflection class assignment in the ordinary noun system is something of a black box, with gerunds there is a morphological and phonological story behind much of this otherwise covert process. This observation can supplement recent studies where inflectional classes are evaluated on the basis of internal measures of predictability such as inflection class transparency (and Stump and Finkel 2013) or paradigm entropy (Ackerman and Malouf 2013). If we isolate the gerund from the rest of the verbal paradigm then these measures will give results similar to those found for ordinary nouns. But if we step back and look at it in relationship to the rest of the verbal paradigm, a different picture will emerge, because the forms are also predicted, wholly or partly, directly from the verbal paradigm. One concrete effect of this difference might be manifested in diachronic change. Thus Nuer might follow the path of Irish and increase predictability of gerund inflection precisely in verbal contexts. One place to look for this might be with glide-final long stems (Table 8), where vowel shortening in the gerund has obscured the transparency of the relationship of inflection to the verb stem. Will predictability ever be restored? We cannot answer this now, of course, but there remain many undescribed dialects of Nuer, so perhaps further work might uncover telling variation in the system. The Nuer facts were suggested by a handful of examples in Crazzolara (1933:139f), remarked on by Baerman (2013), but the full extent has only become apparent as a result of the fieldwork reported here. The Old Irish facts are of course familiar within Celtic and Indo-European studies, but their typological oddity (even within Indo-European) does not appear to have been a topic of concern. We also recognize that the nominals used in Latin verbal constructions belong to different inflection classes, e.g. the gerund inflects as a second declension noun and the supine as a fourth declension noun. But in the context of the verbal paradigm these are no longer inflection class distinctions, because it is same for every verb: inflecting as second declension noun is a property of all gerunds, and inflecting as a fourth declension noun is a property of all supines. The lower figure comes from Simons and Fennig (2017), the higher one from the Joshua Project (joshuaproject.net/people_groups/13909/OD, ET). Tone is the object of ongoing work and we cannot claim to have fully understood it. In addition, there is a fair amount of variation between speakers and/or varieties. In such cases we have represented the tones observed for one reference speaker. The main argument is morphological predictability: the morphological characteristics of the stem are apparent in the transitive, but may be neutralized in the other paradigms. There is also a small class of what might be called ‘middle’ verbs whose basic form is intransitive, which we do not discuss here. Note that many of the forms shown in are identical across different derivational paradigms, but there is always at least one form within the paradigm that distinguishes them. For some verbs, grade 1 vowels may be retained in the multiplicative and centripetal paradigms. In addition, underived roots can have a grade 2 vowel, in which case all derived paradigms also have a grade 2 vowel. This applies to the underived intransitive and derived antipassive. The applicative has grade B, underived transitives tend to have grade A; other categories show either grade, which may be subject to lexical specification (the data are so far unclear). Derived paradigms further differ in terms of the length of the stem vowel, with both vowel lengthening and vowel shortening attested. Within the inflectional paradigm, vowel length is fixed for all categories except the underived transitive and underived intransitive, where longer stem vowel can occur in present singular forms and, occasionally, the antipassive, where the nf stem can differ in vowel length from the rest of the forms. Tonal alternations occur as well. Most ordinary nouns in fact lack a distinct locative, and use the genitive case form in place of it. Those nouns that maintain a distinct locative on the whole refer, unsurprisingly, to locations or goals. Gerunds however reliably display distinct locatives, perhaps due to their use in verbal constructions that require it, as in (10) and (11). The length alternations for case apparent here and in other noun paradigms are largely predictable, but it would take us too far afield to describe them, and they are not crucial for the discussion at hand. Because of this, the gerund of an underived grade 1 transitive verb looks as if it were drawn from the verb’s antipassive paradigm. There are however two reasons to suspect that this is not the case. First, underived grade 1 intransitive verbs – i.e. verbs which do not have an antipassive – likewise form their gerunds with a grade 2 vowel; for example grade 1 nîin ‘sleep.bare’ versus its grade 2 nominative singular gerund Open image in new window . Second, there is a small class of verbs that have a stem-final alternation between /l/ in the transitive and /t/ in the antipassive, and for at least some speakers we find the transitive /t/ in the gerund. Long stems are in fact lengthened to overlong in the singular, but because of various other morphophonological processes that affect length, this remains one of the more reliable environments for observing length contrasts. Stems containing a glide in onset position, immediately following an initial consonant, form their gerunds as if they were short stems. Thus the long grade 2 stem verb Open image in new window ‘cane.2sg’ has the short grade A nominative gerund Open image in new window rather than the long grade B form Open image in new window expected of a long grade 2 stem. The eDIL gives the stem vowel as [oe, oi] rather than [æ]. Conjunct forms involve a distinct set of subject markers used with all prefixed verbs, with unprefixed verbs after certain particles and conjunctions, and, in the earliest period, in clause-final position (Thurneysen 1946:350f). Morphologically, these are taken from the paradigm of verbal adjectives. In practice, the genitive is only used when the verbal noun is (i) governed by a genitive-taking preposition, and (ii) governs a genitive pronominal complement. This is now more of a literary construction than a colloquially productive one (Silva Nurmio and Ruairí Ó hUiginn, personal communication). The effects of word class membership on paradigms are well known, but the examples we know of involve allomorph selection, which is a different issue. For example, in Russian, possessive adjectives form the basis of many surnames. Possessive adjectives normally have case-number endings distinct from what is found with nouns, but these substantivized possessive adjectives have adopted some of the corresponding noun endings (see Spencer 2002:284). The Irish case does not involve the transfer of allomorphs from one word class to another, because the feature set is completely different. Rather, what changes is the paradigmatic context that case marking is embedded in. This research was funded by the Arts & Humanities Research Council (UK) under grant AH/L011824/1 (‘Morphological Complexity in Nuer’). Their support is gratefully acknowledged. We would also like to thank our Nuer language consultants in Kenya, the US, and the UK, without whom none of this would have been possible. Thanks also to Silva Nurmio and Ruairí Ó hUiginn for assistance with the Irish material, to Oliver Bond and Greville Corbett for helpful comments, and to two anonymous referees and the Morphology editor for helping to substantially improve the paper. The order of the authors is alphabetical. Vandevort, E. (n.d.). Nuer field notes. Scanned index cards. online: www.dlib.indiana.edu/collections/nuer. Accessed 24/01/2018.